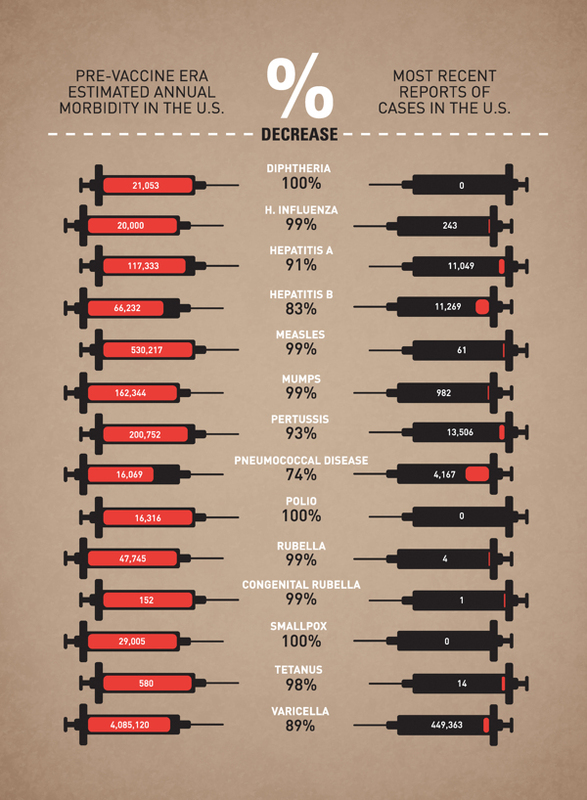 Information graphic on the results of vaccine use in the United States from Leon Farrant, 2013. If there was any doubt about the success of vaccines this graphic shows it clearly. We can eliminate confounding variables such as improved sanitation, since many of these diseases (if not most) are not dependent upon the quality of sanitation, and are merely transmitted from individual to individual. We can eliminate the improvement in health care (other than the obvious one of the accessibility of vaccines) because improved health care wouldn’t prevent most of these diseases. As a result of vaccines, we have eliminated polio, smallpox and diphtheria in the United States. Many other diseases, measles, mumps, rubella, tetanus, and Haemophilus influenzae type b, are nearly eliminated. Though some people in the antivaccination world would make you believe that these diseases are not serious (the pox party is a perfect example of this belief), most of these diseases have known serious consequences for a statistically significant portion of those who get the disease. These adverse consequences may be as minor as hospitalization to as serious as life long chronic health issues or death. Morbidity and Mortality Weekly Report (MMWR), January 7, 2011 / 59(52);1704-1717. Previous PostPrevious Richard III found under a parking lot–are we sure?